Contemporary British artist, Iona Stern, wanted to launch a new website for her artistic work. The main purpose of the website was to present her work in a simple, clean and user-friendly manner, with the facility to sell items directly to customers through the website via in-built ecommerce functionality. We built Iona's site using the Squarespace platform, as it offers a high-quality, robust base to quickly build quality websites that are easy to use and manage, as well as having Ecommerce functionality built-in. 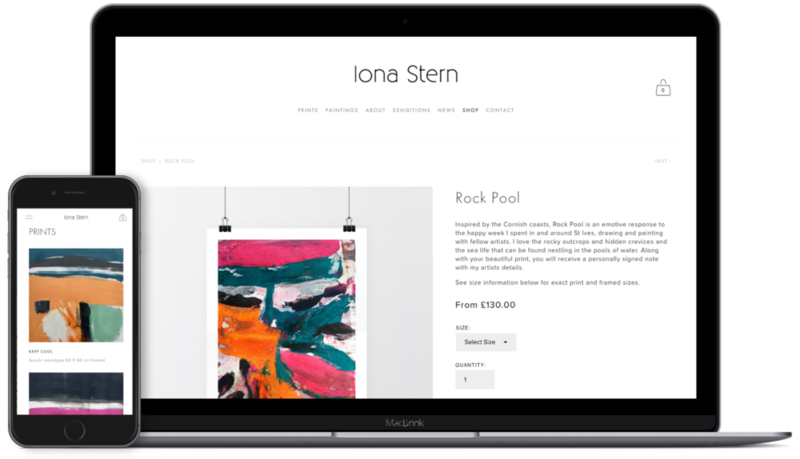 As part of the build, we created an online shop to allow Iona to sell items directly to customers through the website. Creating custom Photoshop templates to allow her to display her work in a simple, easy-to-update format.